Your body is bombarded with toxins 24 hours a day. They come from chemicals and additives in the food you consume and the air you breathe. The idea that your liver cannot cope with this level of toxicity continues to grow in popularity, despite the lack of science to back it up. Apples, apple cider and apple cider vinegar are often used in detox regimens designed to flush your liver of these toxins. 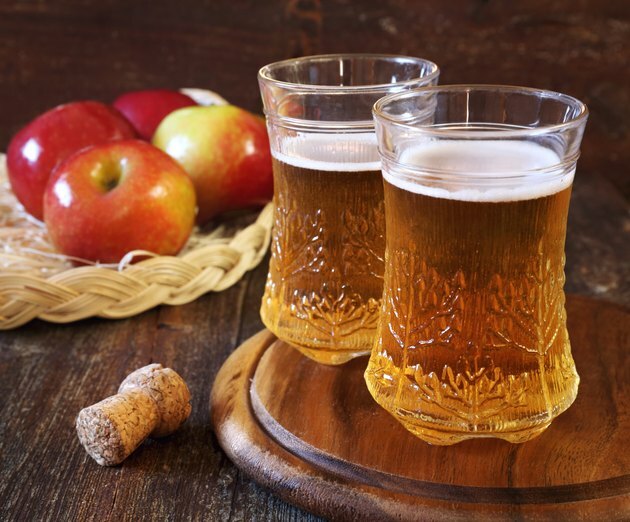 While there’s no proof that a cider detox actually flushes out toxins, increasing your intake of apples and apple products can do wonders for your overall health. Your liver is located just under your diaphragm, on the right side of your body. Considered both an organ and a gland, it does a lot of jobs. Among them are turning toxins into harmless substances and ridding the body of poisons. According to "Debunking Detox," from SenseAboutScience.org, your liver is perfectly able to detox your body, with some help from your kidneys. Ingesting cider and cider vinegar are not necessary for your liver to function properly. An apple a day may not actually keep you from needing to see a doctor, but it can certainly go a long way toward extending the time between visits. Apples deliver more than 10 percent of your recommended intake of vitamin C, which is known to support both liver health and your immune system. Apples contain fiber for healthy elimination and natural sugars that keep your energy levels up without the insulin spikes that lead to fatigue and sugar cravings. Apple cider and apple cider vinegar are made by pressing apples and then straining out the core, pulp and seeds. In the case of hard apple cider and apple cider vinegar, the juice is allowed to ferment. According to Dr. Edward Group at Globalhealing.com, apple cider vinegar is loaded with beneficial nutrients. Among them are acetic acid, which helps to slow starch digestion and avoid insulin spikes; ash, which helps balance the acid to base pH levels in your body; calcium and potassium for strong hair, teeth, nails and bones; antibacterial and anti-fungal malic acid and pectin, which reduces the amount of unhealthy cholesterol in your blood and helps regulate your blood pressure. Of these properties, only the slowing of starch digestion has been linked to weight loss and none of them have been proven to aid in detoxing. Cleansing and detoxing has become a multimillion-dollar business, with sales of detox-related products topping $28 million in 2007, according to a report from CBS News. Dr. Roger Clemens, in a report from BBC News, states that your gastrointestinal tract, immune system and liver are extraordinarily efficient at cleansing your body by neutralizing or excreting toxins naturally. Eating a balanced, low-fat diet featuring fresh fruits and vegetables, whole grains, healthy fats and lean protein will do more to help cleanse your liver than a restrictive cider regimen of any kind. While it’s certainly not necessary to fast or engage in a strict detox regimen in order to support your liver, increasing your intake of apples, drinking organic apple cider and using apple cider vinegar in cooking and for flavoring will also increase your intake of fiber, vitamin C and other nutrients. Taking a tablespoon of raw, unfiltered apple cider vinegar in an 8-ounce to 10-ounce glass of water twice a day before meals helps regulate insulin response to starches and increases your feeling of fullness, according to a 2006 study published online in Medscape General Medicine, but it won’t do anything to cleanse your liver. CBS News.com: Do Detox Diets Work? Are They Safe?